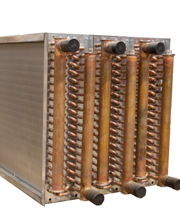 HTL Hydronic Coil are used for many heating and cooling applications. Heat transfer is maximized by using 3/8″ copper tubes running through a high density of aluminum fins that are a density of 12 fins per inch. Despite the high fin density pressure drop is minimized through the coils. 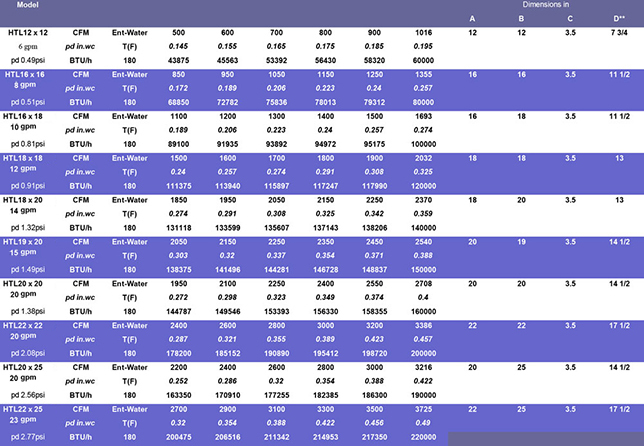 Heat loads are 50,000-60,000 Btu per square foot (please see performance chart). HTL series custom coils are suitable for a variety of heating and cooling applications. These coils are supplied for both new installations and as direct replacements of existing coils. The custom steam coils can be designed for a wide range of steam pressures with pitched in casing to enable rapid condensate removal. The headers are designed to optimize the steam flow such that it is evenly distributed throughout the coil. HTL series cooling coils are designed to maximize heat transfer while minimizing static pressure loss on the air flow. 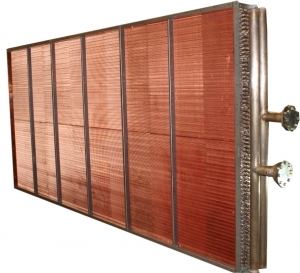 Cooling coils where water is utilized as the cooling medium are sized to ARI standards using proprietary software. 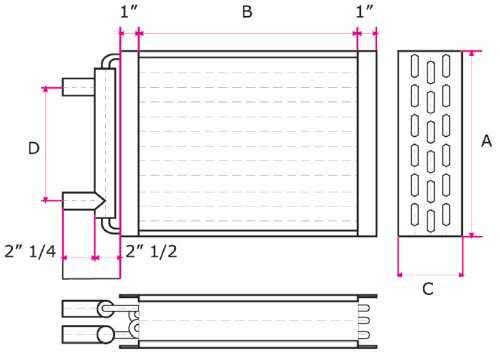 DX Evaporator and condenser coils are also available for a variety of applications such as heating, cooling and dehumidification. They are available with a wide range of pressure ratings and can be designed for use with any refrigerant. 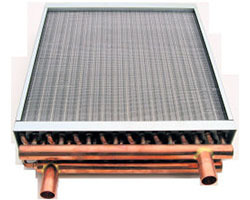 The evaporator coils are counter flow circuited carefully designed to ensure even distribution of refrigerant. The floating tube design protects from thermal expansion/contraction. Replacement coils can be fabricated for exact replacement of existing coils for a wide variety of applications. In many cases coils must fit specific dimensions. HTL’s wide range of coil and tube sizes, fin spacing, and coil connection orientations provide the needed flexibility to provide exact drop in replacement coils. Please fill in the required information to enable us to provide a quote.